Eugene F. Black was born in Marine City, Michigan, on January 27, 1903. He was graduated from Port Huron High School in 1921 and then studied law for a year at the Detroit College of Law. Black then became a statutory law student in the office of former Circuit Judge Shirley Stewart. Following one special term of study at the University of Michigan Law Department in 1925, he was admitted to practice law. In 1942, in the middle of World War II, Black enlisted in the United States Naval Reserves as a lieutenant. He was trained in Princeton, New Jersey, and was a submarine chaser in Miami until an old knee injury forced him into inactive duty. He subsequently returned to practicing law. Black was involved in many different educational organizations. He served two terms as president of the St. Clair County Council of Parent-Teacher Associations. Later, he became chairman of the State P.T.A. committee on public school education. In 1945, Black was elected Attorney General for the State of Michigan on the Republican ticket, yet he did not seek renomination for that office. 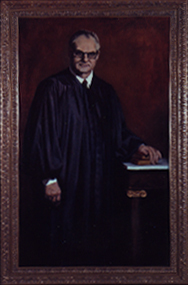 He was appointed Judge of the Thirty-First Circuit by Governor G. Mennen Williams and served until he was elected to the Michigan Supreme Court as a Democrat in 1955. Throughout his career, Black was very opinionated and outspoken regarding his feelings about the Court. He was very critical of the Court and his colleagues on the Bench and even planned the timing of his retirement based on changing Court policy. Black retired from the Court in 1973, yet his presence in politics was still felt.